This rainbow of vibrantly colored roses creates a special bouquet indeed. 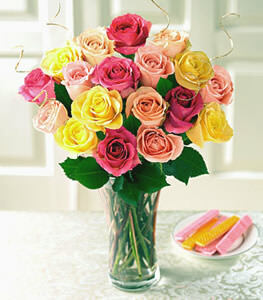 Eighteen multi-colored roses come artfully arranged with greenery in a glass vase. Just a note from a happy customer: Flower delivery was made in 1 hour--Im impressed! Thanks for the same day delivery option, Ill definitely recommend your service to others.